How do I use Reveal? How do I build a dashboard in Google Analytics? This guide will show you how to build a dashboard in Google Analytics to track your Reveal data. Before building dashboards, you should have finished setting up your Reveal Google Analytics integration. If you haven't done so already, you can get started here. Press Create to create a new dashboard. Click on Blank Canvas for a clean view of your Reveal data. With widgets in dashboard, you're able to track the specific dimension(s), you've set up with Clearbit Reveal, like Clearbit Company Domain or Clearbit Company Name. Select Table as the Standard. Under Display the following columns, set the dimension you want to track and add Users as the metric. In this example, we've successfully set up Clearbit Company Name as the dimension to track. Note: you'll have to add each unique dimension as a widget to see Reveal data for the specific Clearbit data point. Within each dimension, you can set filters to only show the audience you want to track. Click on Filter to add a filter. Choose between Don't show or Only show. Specify the Dimension and condition you want to filter for. In this example, we've filtered out Company Names with Clearbit and companies of a particular size. 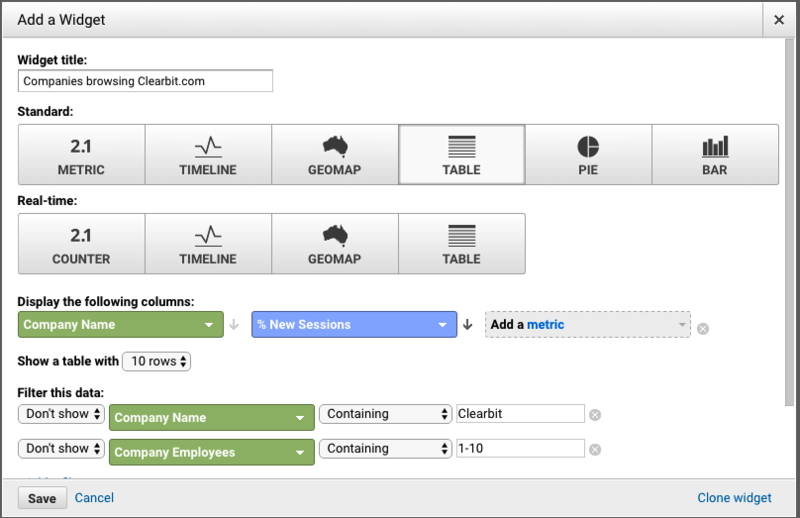 To filter by Company Employees, here are the Employee Ranges Clearbit returns. Name your Segment (we'll use Target Tech here). Under Advanced, click on Conditions. Click on Add Content and select Company Tech. Note: In this example, we've named our Segment Target Tech and have set the conditions to allow us to segment incoming Reveal data for companies that use a specific tech. Here's a walkthrough of how to add a Segment. Now that you know how to create Widgets and Segments with Reveal Data, options are limitless on how you'd like to use them. Now that you have your dashboard set up in Google Analytics, you'll start to notice Reveal data trickle onto the widget with time. Clearbit's Reveal results are dependent on the volume of traffic from your site so it's recommended to allow 2 weeks for a more comprehensive overview of the data captured. If you're not seeing Reveal data in your GA an hour after setup get in touch with us at support@clearbit.com and we'll help you out! How do I build a report of companies visiting my website in Google Analytics? How do I calculate my monthly web traffic? How are Reveal credits counted?